Just cookin’ for a few hungry friends. Photo by The Q Speaks. Some rivalries in Spain are hard to kill. Real Madrid vs. FC Barcelona. PP versus PSOE versus…Podemos? And in Catalonia, another harsh battle is being fought: the fideuà versus the paella. 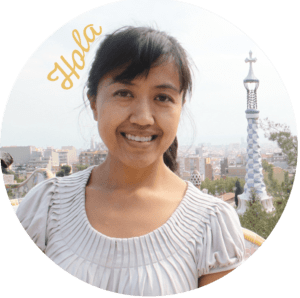 Anyone familiar with Spanish food knows about paella, a one-pot rice dish stuffed with goodies like mussels, shrimp, chorizo, rabbit, peas, or other ingredients. It belongs to the list of the most popular Spanish icons like bullfighting and flamenco. And Antonio Banderas. Fideuà, on the other hand, is the lesser known dish and is very similar. Instead of using rice like its cousin, it’s made with short pasta and embodies a different texture. One more thing in common: How to enjoy it! Paella’s original recipe dates back from the 15th and 16th century when campesinos in the Valencia countryside mixed rice, snails, and vegetables in a pan on an open fire. Slowly, the paella recipe morphed and spread to distant ends of the Earth, all the way to South America and the Philippines. Hundreds of variations of the paella now exist. Shrimp, artichoke, and duck are just some other ingredients you can add to your rice dish. 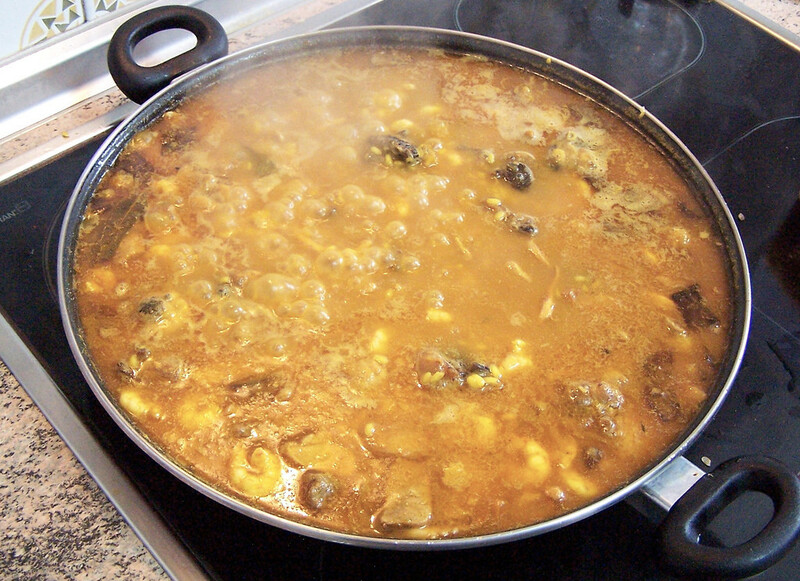 Fideuà is also a variation born out of the paella. 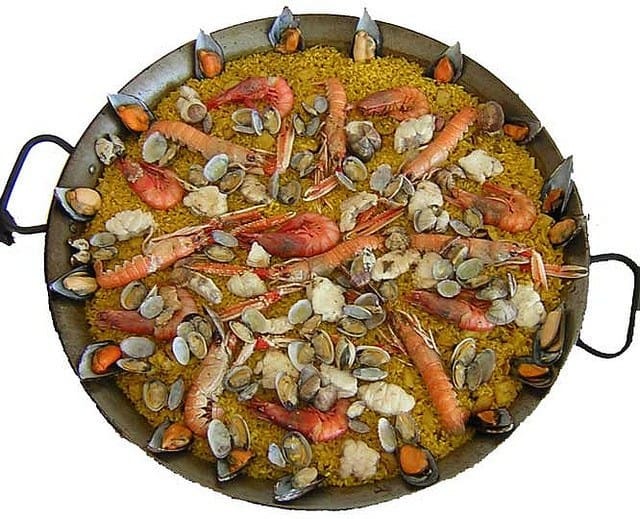 Legend has it that in 1920, a fisherman in Gandia, Valencia, cooked paella for his crew, and the rice-loving captain would eat all of it, leaving nothing for the others. The fisherman then substituted short noodles for the rice, hoping the captain would dislike it and leave a meal for the rest. Since then, the recipe has stuck around and became known as fideuà, now commonly served in Valencia and Catalonia. In fact every year, the town of Gandia holds a famous fideuà competition. I love me some socarrat, the crispy top and bottom of the pan. Photo by JaulaDeArdilla. Where it’s cooked. 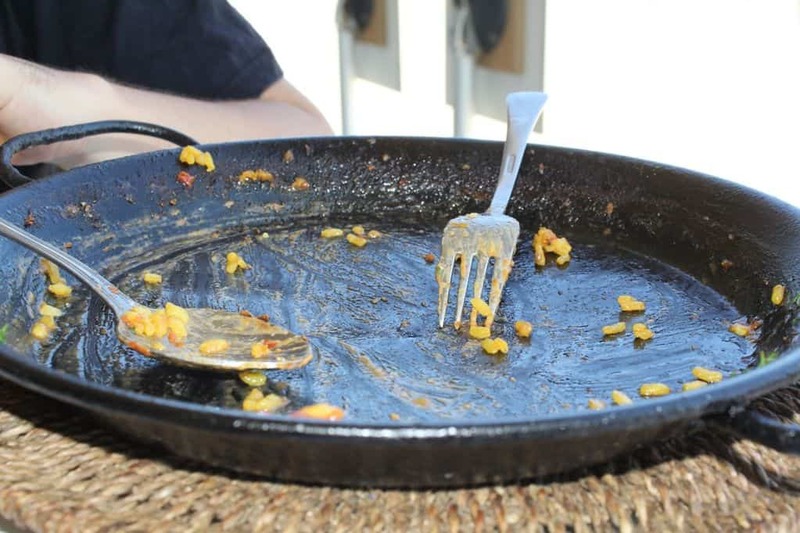 Both paella and fideuà are cooked in a shallow, wide flat iron pan, which gets the starch cooked evenly and lets the water evaporate uniformly. The complex, flavorful base. It’s key to having a good stock and/or sofrito, or seasoning sauce, depending on your recipe. While ingredients vary as well, the base often includes shrimp shell stock, saffron, olive oil, tomatoes, garlic, and onions. And when it’s made from scratch, it gives the dish that amazing, deep flavor. The slow process of adding hot water to cook it. You add it intervals, making sure that the rice or pasta isn’t too dry and hard nor too moist and goopy. A slow simmer. Photo by Juan G. Hurtado Pecino. Paella: The secret is to use the right type of rice, a grain that is rounded and short and doesn’t end up creamy like risotto. It also absorbs water and doesn’t stick. Good types include bomba, calasparra, bahía, or senía. These soak up the rich flavor of the stock and the grains are separate when cooked. Fideuà: It’s a short pasta, so you don’t get the same chewiness that the rice gives. But if the pasta cooked right, it has a medium weight and has crispy crust and the bottom of the pan. Paella: As I’ve mentioned, recipes are varied. 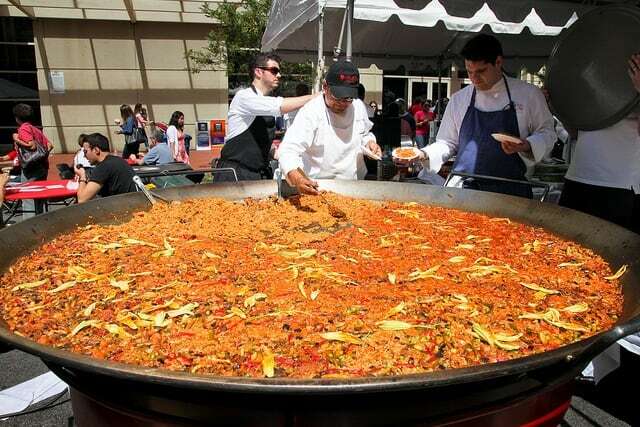 But popular ones include seafood paella, meat paella, Valencian paella, and black paella. Other ingredients can be prawns, calamares, chicken, pork, beef, and even beans! 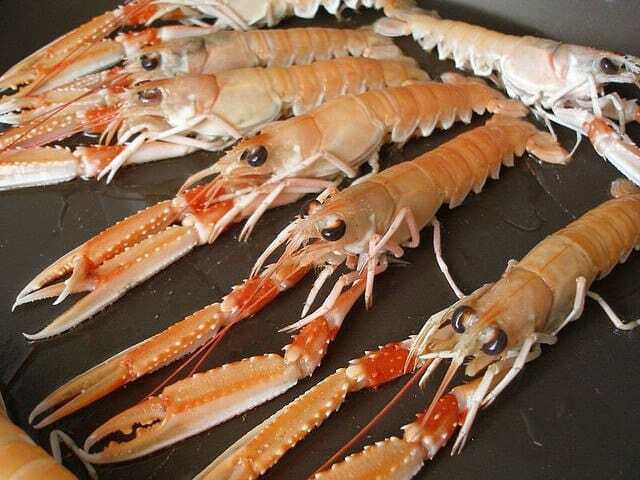 Fideuá: Seafood is the main ingredient of choice, whether it be shrimp, clams, cuttlefish, langostines, or others. Paella: A squeeze of lemon gives the paella another dimension. But don’t overdo it, or you’ll kill the flavor. Fideuà: It can also be enhanced with a lemon squirt. But it’s often accompanied by a dollop of allioli, a garlic mayonnaise that creams up the texture. Personally, it’s a bit over-the-top for me. My favorite ingredient in paella or fideuà! Photo by Anna Fuster. 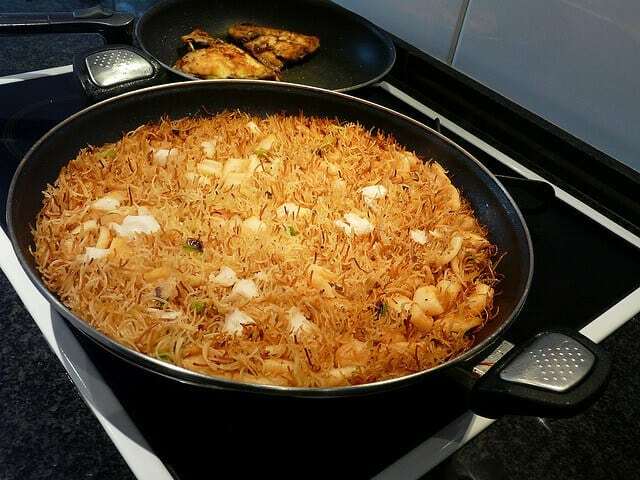 Served in the pan it was cooked, both the paella and fideuà reunite family and friends. The way everyone gathers around the warm dish for everyone to share — that’s how it’s enjoyed best. Add some long conversations, some wine or cervezas… Bon profit! Of course, you can order fideuà or paella as a menu item served on a separate plate, but that’s not as fun, is it? I have a strict No Grain Left Behind policy. What about you? Have you tried paella? Fideuà? Which one do you like better? Fideuà times 100! Preferably with a dollop of homemade alioli. Times 100, really? Just a dollop of alioli would be enough! I’ve only tried fideuà once or twice, but I like paella better. The rice is just so good! Totally with you, Jessica. You probably only need to try it once or twice! A good arros al forn is better than both! Ooh, I’ve never heard of that… Where can I try it? All these dishes made me drool (as silly as it sounds). They are absolutely mouth-watering. Great post!